Summer is a fantastic time of year for a florist. You get the opportunity to create wonderful summer bouquets and designs. It is also a time of year when flowers look so bright and cheerful and immediately remind you of warm summer days. A florists’ is always packed full of vibrancy and colour at this time of year - there is such a wide choice of beautiful blooms and rich foliages. A bouquet is one of the quickest and simplest things to make for a florist and during the summer you can create maximum impact with a few choice coloured flowers and foliage. Certainly a summer haze bouquet would be the perfect gift for birthdays anniversaries and would definitely bring a smile to the face of someone who is not well. If it is for a special occasion, elaborate gift wrapping such as luxury paper or cellophane finished off with a sumptuous tie would really make it. The emphasis here must be to create a bouquet that just shouts “sunshine!” Think yellow, oranges and reds. The design should draw you in, radiate warmth and make you feel happy. So think flowers that do just that. Perfect summer flowers include; roses; gerbera; chrysanthemums; carnations; dahlias; lilies; lisianthus; protea; celosia; lutea; hypericum; sunflowers; delphiniums; lupins; gladioli and allium. The majority of these flowers are now available all year round so you can bring sunshine and summer to someone anytime of the year. They can be bought from the florists or from any major supermarket. 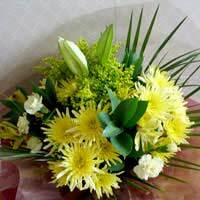 Four stems of solidago; one stem of Asiatic lily; three stems of spray chrysanthemums; three stems of alstromeria; bunch of spray carnations; hard ruscus; five palm leaves; string; pot tape; cellophane; sellotape; bow. Cut the cellophane and place the bouquet on its side upon it then pull up one side of the cellophane to cover the bouquet and tuck it around and secure with sellotape. Repeat this with the top edge of the cellophane coming to just the top of the bouquet. Tie with bow!